This article is about Cities (Towns with Class-I status or population with 100,000 and above). For Towns under 1 lakh population, see List of towns in India by population. 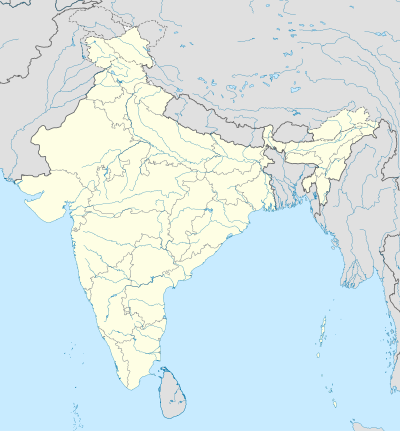 Location of Indian Cities. Hover over the dot to see the city name with rank in parentheses. The list includes the cities and not urban agglomerations. The cities listed in bold are the capitals of the respective state / union territory. ^ Anakapalle, Bheemunipatnam municipalities and 10 gram panchayats of Parawada were merged into Greater Visakhapatnam Municipal Corporation. ^ a b c "Provisional Population Totals Urban Agglomerations and Cities" (PDF). Census of India 2011. Retrieved 30 January 2016. ^ "City definition by census India". censusindia.gov.in. Archived from the original on 17 June 2007. Retrieved 26 May 2014. ^ a b c d e f g h i j k l "Provisional Population Totals, Census of India 2011; Cities having population 1 lakh and above" (PDF). Office of the Registrar General & Census Commissioner, India. Archived from the original (PDF) on 7 May 2012. Retrieved 26 March 2012. ^ "CM okays merger of Anakapalle and Bhimili with GVMC". The Hindu. Retrieved 26 May 2017. ^ "Vijayawada Population 2011 Census". Census2011.co.in. Retrieved 22 October 2016. ^ "Kota Municipal Corporation". Citypopulation.de. Retrieved 10 June 2016. ^ "Sanitary works in 18 Tiruchi wards to be outsourced". The Hindu. 28 November 2013. Retrieved 25 August 2015. ^ "Warangal Municipal Corporation, Budget 2014–15" (PDF). Greater Warangal Municipal Corporation. p. 2. Archived from the original (PDF) on 17 February 2015. Retrieved 4 February 2015. ^ "Guntur city population is 7,43,354 as per 2011 Census". The Hindu. Guntur. 26 May 2013. Retrieved 12 October 2014. ^ "Integrated Municipal Solid Waste (MSW) Management Project" (PDF). Swachha Andhra Corporation. Government of Andhra Pradesh. p. 20/4. Retrieved 31 October 2016. ^ "Annual congregation prepared in Jammu, winter capital of Indian-controlled Kashmir - Xinhua - English.news.cn". ^ "Smart City Challenge-Erode". Government of India. Retrieved 15 December 2015. ^ "22 villages may be included in Rajahmundry soon". The New Indian Express. Rajahmundry. 11 February 2013. Retrieved 14 August 2015. ^ "Rajahmundry Municipal Corporation Enlarged with 21 Gram Panchayats". Tgnns.com. Commissioner and Director of Municipal Administration, Andhra Pradesh. Retrieved 14 August 2015. ^ "City profile". Tirupati Municipal Corporation. Archived from the original on 23 December 2015. Retrieved 23 December 2015. ^ "Eluru Municipal Corporation". Elurucorporation.org. Retrieved 22 October 2016. ^ "Purnia (District, Bihar, India) - Population Statistics and Location in Maps and Charts". Citypopulation.de. Retrieved 22 October 2016. ^ a b c d e "Cities in India with population more than 100,000". Census2011. Retrieved 10 June 2016. ^ "Ramagundam Municipal Corporation". Ramagundam Municipal Corporation. Retrieved 16 August 2015. ^ "Introduction". chittoormunicipalcorporation. Retrieved 30 June 2015. ^ "Saharsa". citypopulation.de. Retrieved 9 December 2017. ^ a b "Rohtas". citypopulation.de. Retrieved 9 December 2017. ^ "Vaishali". citypopulation.de. Retrieved 9 December 2017. ^ "Siwan". citypopulation.de. Retrieved 9 December 2017. ^ "Paschim Champaran". citypopulation.de. Retrieved 9 December 2017. ^ "Purba Champaran". citypopulation.de. Retrieved 9 December 2017. ^ "Kishanganj". citypopulation.de. Retrieved 13 December 2017. ^ "Munger". citypopulation.de. Retrieved 13 December 2017. ^ "Buxar". citypopulation.de. Retrieved 13 December 2017. ^ "Jehanabad". citypopulation.de. Retrieved 13 December 2017. ^ "Aurangabad". citypopulation.de. Retrieved 13 December 2017. ^ "Gangtok City Population Census 2011 - Sikkim". www.census2011.co.in.